Create Your Own Cat Halloween Makeup at Home With This Easy Tutorial! Whether you’re going for a cute kitty cat or feisty feline Halloween makeup look, you’ve slinked to the right place! It’s true! One of the easiest Halloween costumes to create yourself is a cat. It’s just so simple, you’ll want to recreate this look every year. All it involves is your makeup bag and a quick online shopping session to get you looking puuurfect (that line never gets old!). So here is what we’ll be focusing on: eyes and lips. You guessed it. We’re keeping the eyes the focal point of this look, so keep in mind that there will be a lot of liner and mascara. And that liner will be making a cameo elsewhere on your face (hello, nose and cheeks!). Unleash your inner feline by going for a bright red lip too! This is Halloween after all, so it’s okay to highlight two areas of your face. Being a tiny bit extra is always acceptable in our book. Read on as we break down each step, photo by photo, and fill you in on what you’ll need (or what you already have) to sink your claws into this easy makeup tutorial. 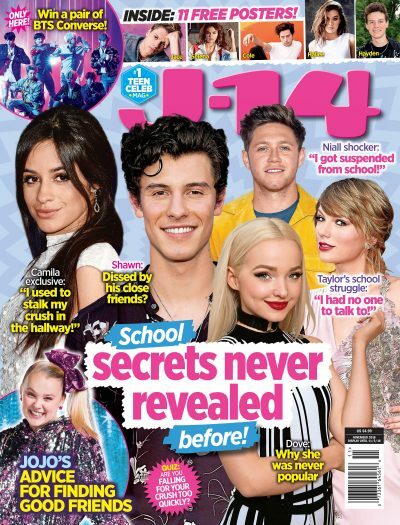 Also, watch the video below to see how the fabulous J-14 beauty expert Racquel Stewart creates the look in seconds. Firstly, dust a light metallic pinky-copper shimmer shade (with a hint of sparkle!) to the entire eyelid. Racquel chose the shade Trick (what an appropriate eyeshadow name for this time of year) from the Urban Decay Naked 3 Eyeshadow Palette ($65.19). And if you haven’t heard or own this palette yet, then what are you waiting for? It’s filled with 12 rose-hued eyeshadow shades that range from shimmery to matte finishes. Then, use a shimmery neutral pearl shade to highlight the inner corners of your eyes. Racquel picked the lightest shade found in the Technic Bronzing 6 Colour Baked Eyeshadow Palette ($4.58). These highly pigmented eyeshadows are perfect for any occasion. Wear all six colors at once, or choose between the dusty browns and pearlescent pinks to satisfy your eye looks. Now it’s time to make that feline fervor come alive with a careful lining and flick. Make sure to draw out a precise line and meet it at the bottom of your tear duct for that quintessential cat-eye effect. The Maybelline New York Eye Studio Master Precise Liquid Eyeliner in Black ($5.64) is easier to navigate since it comes in an easy-to-hold pen shape. It’s a dark, intense black with an impressive 12-hour wear time. Go even bolder by lining the waterline. The Benefit Cosmetics BADgal Liner Waterproof in Black ($29.99) is a soot-black eyeliner that glides on smoothly and won’t tug, smudge, or smear. We love the blending tip on the other side that makes it easier to smudge and control any smoky eye. Give your surgeon-precise hands a break by filling in your brows. In just a few strokes, you’ll be able to define and fill in any awkward gaps on your brows with the Barry M Cosmetics Brow Wow pencil in Light/Medium ($7.50). Once you’re done filling them in, use the spooley brush end to give your hairs a final combing so that they stay in place. It’s not too long until we’re back at the eyes, adding a bit of highlight to the brow bone. The Barry M Cosmetics Bold Waterproof Eyeliner in White ($7.25) is awesome! It feels just as smooth as a liquid liner but has the precision of an eye pencil. It lasts for hours and comes in a bunch of different colors. And now, it’s time to finish off your literal cat eye with a few coats of mascara. Racquel’s Artdeco Angel Eyes Mascara can be duped for Maybelline New York Volume Express Colossal Cat Eyes Washable Mascara in Glam Black ($4.98). And remember — swipe a few layers of that mascara on top and bottom lashes. This mascara has the word “cat” in its name, so don’t you think it’s going to be good? It is! Its collagen formula and claw brush pumps up lashes for colossal volume. Use that same Benefit Cosmetics BADgal Liner to fill in the tip and sides of your nose for your, well, now cat nose. Draw a heart starting from the middle of the tip of your nose and repeat on the other side. Now you just have to fill it all in. Pucker up, kitty cat! If a cat had lips, we think it would most definitely choose a red lip to evoke its sultry persona. Show off your lip shape by outlining with Charlotte Tilbury Lip Cheat Reshape & Resize Liner in Savage Rose ($25.83). This velvety liner will reshape and resize your lips, however you choose. Its paraben-free formula won’t transfer or feather, so don't worry about your lip shade fading when you're chomping on candy. Make sure to fill in your lips with the pencil, which will help your lipstick stay put. For the final touch of lip appeal, layer on a coat of Charlotte Tilbury Matte Revolution Lipstick in Red Carpet Red ($45.15). Even though it's a matte lipstick, its hydrating formula is built to last. Plus, the revolutionary square-angled tip mimics the shape of a lip brush for a precise application. Now that your cat look is almost complete, finish off with the black eyeliner again, drawing a straight line down the ridge (that indented space between the nose and the upper lip) of your lip. Then outline your upper lip with a layer of the black pencil to enhance the look. Add a few dots and three lines for whiskers and you’re set! Last but Not Least… Cat Accessories! This set includes a cat headband, bowtie, and tail with silver tone metallic accents to complete your cat makeup. Feeling a little more frisky? Wear this cotton body con suit that’s so slinky. This is adorable! Wear a functional crossbody bag in the shape of a carton of milk for when you start getting thirsty. Watch Racquel create this look in seconds below! Super easy kitty cat makeup tutorial!